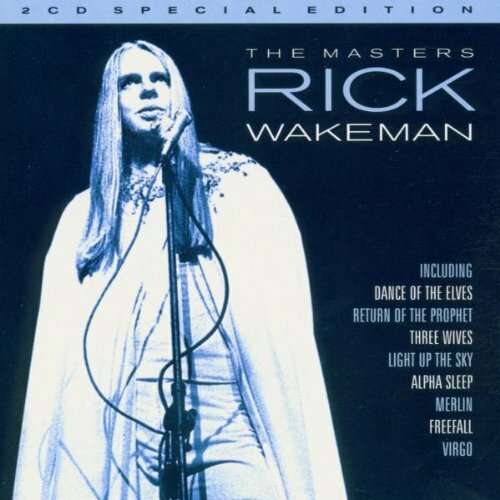 Between 1982 and 1995 Wakeman released a staggering 35 recordings! None of these are known to more than a few people (I have only seen about four of them myself), so the convenience of this compilation of 20 tracks from 13 albums of that period is certainly a foregone conclusion. Disc one blasts off with a surprisingly commercial pomp-rock tune with absolutely astonishing production quality, and a singer who could have replaced Steve Walsh in Kansas! Who is he?? A pair of flashy prog instrumentals follow; nice, if cliched, but great keyboard work. A jazzy piece from his Zodiac CD follows but seems unfinished, like a demo. Later he cranks up the drama on two more instrumental prog numbers. Then there is a poorly executed pop song which doesn't match the production quality of its predecessor. Closing out this half are a completely remade suite from Six Wives which features loads of new material; and a beautiful piano-based song with percussion accompaniment. Disc two starts with another stab at radio play, but quickly (and fortunately) abandons it in favor of more instrumental piano and synth-heavy pieces from Rick's relatively recent concept albums: Romance of the Victorian Age, and 7 Wonders of the World. A couple veer nigh a light new age side; others are deadringer Brahms/Beethoven piano material. A live reworked suite from Merlin (again with a ton of new twists added) provides contrast. Based on what this CD offers I'd choose Tapestries and No Expense Spared as the two recommendables. But this leaves another 23 recordings — including three soundtracks — that (probably like you) I have never heard, so my judgement is of limited value.